This set is a sample of my kindergarten Problem Solving set. 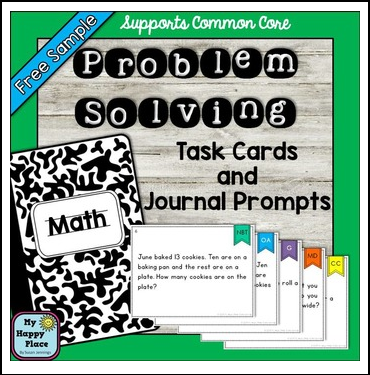 This set includes six problems on task cards and math journal prompt strips. This set is designed to get students thinking and talking about math. With the color-coded task cards, you will always have a problem at your fingertips. Use the cards on the carpet or in small groups—even while waiting in line. The problems vary in difficulty and are perfect for think-pair-share and for developing math vocabulary and language. Have the children extend their learning by using the included math journal prompts. Each of the problems is also included as a cut and glue journal prompt. This allows children to draw and write to show their mathematical thinking. For more Common Core math products, click here.